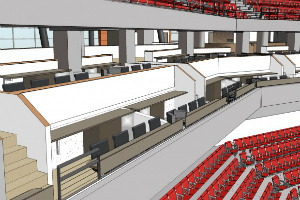 Loge boxes are the second tier of premium seating at Pinnacle Bank Arena. The most exciting concept in arena seating today, loge boxes combine the intimacy of stadium box seats and the upscale amenities of a suite to create a truly unique and unmatched viewing experience. The 20 open-air boxes are on the same level as the arena's enclosed suites. Each loge box includes seats with casters, four tickets to all Pinnacle Bank Arena events, a drink rail and buffet counter, under-counter refrigerator, storage cabinets and flat-screen TV. Loge box patrons share a lounge and private restrooms on the same level with suite patrons, and have parking in the adjacent garage.